This updated edition of the witty bestseller provides jargon-free answers to the basics of grammar, style, and usage. Patricia T. O-'Conner, a former editor at The New York Times Book Review, is a popular author, radio commentator, and blogger. 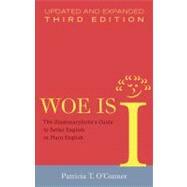 She has written four other books on language and writing: Woe Is I Jr., Words Fail Me, and, with Stewart Kellerman, You Send Me and Origins of the Specious: Myths and Misconceptions of the English Language.